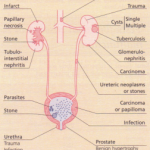 The nephrotic syndrome consists of heavy urinary protein loss, hypoalbuminaemia and oedema. Hypercholesterolaemia is almost always present. Urinary protein loss of the order of 3-5 g daily or more in an adult is required to cause hypoalbuminaemia. In children, proportionately less proteinuria results in hypoalbuminaemia. 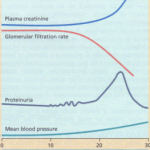 the urine and concealing the extent of protein loss through the glomerulus. The mechanism of the proteinuria is complex. It occurs partly because structural damage to the glomerular basement membrane leads to an increase in the size and numbers of pores, allowing passage of more and larger molecules. Electrical charge is also involved in glomerular permeability. Fixed negatively charged components are present in the glomerular capillary wall, which repel negatively charged protein molecules. Reduction of this fixed charge occurs in glomerular disease and appears to be an important factor in the genesis of heavy proteinuria. Pathogenesis of oedema in hypoalburninaemia The pathogenesis of the oedema is incompletely understood. The conventional explanation is that a reduction in the concentration of osmotically active albumin molecules in the blood results in a reduction in the oncotic force that retains fluid within blood vessels, and salt and water escapes into the extravascular compartment, i.e. oedema occurs. Such loss of salt and water results in a fall in blood volume and a reduction in pressure within afferent glomerular arterioles. This activates the reninangiotensin- aldosterone system. The consequent hyperaldosteronism promotes sodium and water reabsorption in the distal nephron, increasing the tendency to oedema. However, measurements of these various parameters do not always support this concept. The plasma renin activity in nephrotic patients is often normal and measured blood volume may be normal or high in nephrotic patients, even those without renal failure. All types of glomerulonephritis can produce the nephrotic syndrome. Although proliferative glomerulonephritis is commoner than membranous disease, the latter is the commonest cause of nephrotic syndrome in adults in the UK. Minimal change glomerular disease accounts for most cases of the nephrotic syndrome in childhood compared with approximately 20% of adult cases. In tropical areas minimal change is present in fewer than 10% of nephroticchildren owing to the high incidence of nephrotic syndrome due to infections such as malaria. Minimal-change disease does not progress to chronic renal failure. Diabetic glomerular disease can also cause the nephrotic syndrome. The histological lesion seen on light microscopy in diabetes may comprise amorphous nodular deposits, which are not immune complexes, in the glomeruli or a diffuse glomerulosclerosis. There is associated glomerular basement membrane thickening. Diabetes is also a cause of renal papillary necrosis, but patients with this lesion alone do not have sufficiently heavy proteinuria to become nephrotic. Many drugs can cause sufficiently heavy proteinuria to result in the nephrotic syndrome. Penicillamine, which in all probability combines with a plasma protein to form an antigen hapten, induces an immune complex-mediated membranous glomerulonephritis, as may high dose captopril. Various metals, whether used therapeutically (e.g. gold) or in industry (e.g. mercury and cadmium), can induce proteinuria severe enough to cause the nephrotic syndrome. Reactions to many allergens such as poison ivy, pollens, bee stings and cows’ milk may be associated with the nephrotic syndrome, but evidence of a causal relationship is lacking in most cases. Most lists of causes of the nephrotic syndrome include renal vein thrombosis, but this is probably a complication rather than a cause of the syndrome. It is particularly likely to complicate membranous glomerulonephritis. In nephrotic patients the blood is more coagulable than normal and the circulation may be sluggish owing to hypovolaemia, both of which are likely to induce thrombosis. Estimates of the incidence of this complication range from 5% to approximately 50% in nephrotic syndrome due to membranous glomerulonephritis. 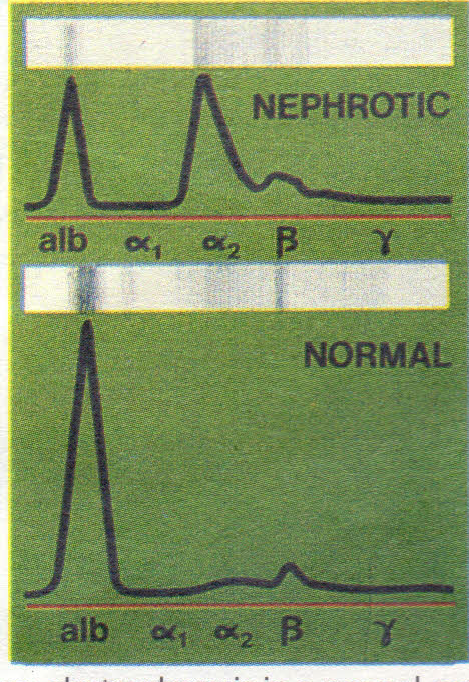 Renal disorders not associated with the nephrotic syndrome. Proteinuria severe enough to cause the nephrotic syndrome is not a feature of reflux nephropathy (chronic atrophic pyelonephritis), chronic tubulo-interstitial nephritis, renal tuberculosis, polycystic disease or many other renal disorders. ‘The hisrorv may provide clues to the aetiology, e.g. exposure to a drug or allergen. Patients with minimalchange lesion may give a his.ory or family history of atopy. There may be a family history of renal disease. Patients with heavy proteinuria may have noted that their urine has been frothy; the onset of the renal lesion can be timed from this observation. Examination will reveal oedema; ascites may also be present, particularly in children. Genital oedema is sometimes seen. Th oedema may involve the face (periorbital oedema) and arms. Neither elevation of the jugular venous pressure nor pulmonary oedema are features of the nephrotic syndrome, though either or both may be present if renal and/or cardiac failure are present in the nephrotic patient. PRIMARY CARDIAC FAILURE: here, the venous pressure is high, oedema is not usually present in the face, and the proteinuria is less severe. 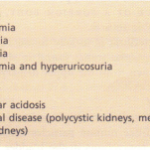 LIVER DISEASE, and other causes of hypoalbuminaemia (Table 9.10), with oedema and ascites. Increased hepatic albumin synthesis is accompanied by increased cholesterol synthesis and there is an approximate reciprocal relationship between the serum albumin and the serum cholesterol concentration. Low-density lipoprotein (LOL) cholesterol concentrations are elevated but high-density lipoprotein (HOL) cholesterol is usually normal. Hypertriglyceridaemia is present in about 50% of patients. Minimal-change lesions do not usually result in red cells or red-cell casts in the urine. SERUM C3 COMPLEMENT CONCENTRATIONS may be decreased in immune complex-mediated glomerulonephritis. THROAT SWAB AND SERUM ASO titre may show evidence of streptococcal infection. PRESENCE OF ANTINUCLEAR FACTOR may suggest SLE and of ANCA (see p. 451) a systemic vasculitis. SERUM ELECTROPHORESIS. 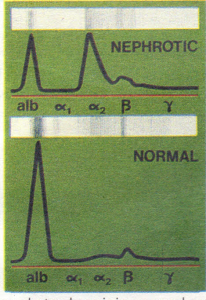 In the nephrotic syndrome there is always a reduced serum albumin, commonly with an increase in the a- and /3-g10bulin fractions (Fig. 9.15) on serum electrophoresis. In myeloma, abnormal protein bands may be found, including Bence-lones protein in the urine. Ten per cent of patients with myeloma have amyloid and can develop the nephrotic syndrome. RAISED BLOOD GLUCOSE indicates diabetes mellitus. SELECTIivE PROTEIN CLEARANCE may be measured. Blood and urine samples are taken at the same time; a timed urine collection is not required. The clearance of large-molecular-weight protein such as IgG is compared with that of a smaller molecule such as albumin or transferrin. A low ratio (selective protein leak) is found in minimal-change glomerulopathy, early diabetes and renal amyloidosis. Severe glomerulonephritides, e~g. diffuse proliferative glomerulonephritis with crescent formation, are more typically associated with an unselective protein leak. Overlap between the groups exists. Measurement of selective protein clearance is unnecessary if renal biopsy is to be carried out. Its main use is in children in whom a minimal-change lesion is suspected. An unselective protein leak in such a child would bring this diagnosis into question and might prompt renal biopsy. 1 In young children (particularly males) who have a highly selective protein leak, no hypertension and no red cells or red-cell casts in the urine. The diagnosis is almost certain to be a minimal-change lesion, so that a trial of steroids should be instituted first. 2 In long-standing, insulin-dependent diabetes with associated retinopathy or neuropathy, since the diagnosis is in little doubt. 3 In patients on drugs such as penicillamine, which should be stopped first. Initial treatment should be with dietary sodium restriction and a thiazide diuretic, e.g. bendrofluazide 5 mg daily. Unresponsive patients require frusemide 40- 120 mg daily with the addition of amiloride (5 mg daily), but the serum potassium concentration should be monitored carefully. Patients are often hypovolaemic, and moderate oedema may have to be accepted in order to avoid postural hypotension. A high-protein diet (approximately 80-90 g protein daily) confers no benefit and normal protein intake is advisable. Infusion of albumin produces only a transient effect and is normally employed only in diuretic-resistant patients. Such infusion is combined with diuretic therapy. 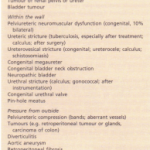 Diuresis, when once initiated in this way, often continues with diuretic treatment alone. Specific measures The aim is to reverse the abnormal urinary protein leak. MINIMAL-CHANGE GLOMERULAR LESION. High-dose corticosteroid therapy with prednisolone 60 mg daily (dose corrected to a normal body surface area of 1.73 rrr’) for 8 weeks corrects the urinary protein leak in more than 95% of children. Response rates in adults are significantly lower and response may occur only after many months of steroid therapy. Spontaneous remission also occurs and steroid therapy should, in general, be withheld if urinary protein loss is insufficient to cause hypoalbuminaemia or oedema. In both children and adults, if remission lasts for 4 years after steroid therapy, further relapse is very rare. In children, approximately one-third do not subsequently relapse, but in the remainder further courses of corticosteroids are indicated. One-third of these patients relapse regularly on steroid withdrawal and in these patients remission is induced with steroid therapy once more and a course of cyclophosphamide 3 mg kg-l daily is given for 6-8 weeks. This increases the likelihood of long-term remission. Steroid-unresponsive patients may also respond to cyclophosphamide. No more than two courses of cyclophosphamide should be prescribed in children because of the risk of side-effects, which include azoospermia. An alternative to cyclophosphamide is cyclosporin, which is effective but must be continued long term to prevent relapse on stopping treatment. Excretory function must be monitored carefully as cyclosporin is potentially nephrotoxic. MEMBRANOUS GLOMERULONEPHRITIS OTHER CAUSEs. Remission occurs if the underlying disease can be treated. In patients with SLE, treatment with steroids and cyclophosphamide or azathioprine usually induces long-term remission. When the glomerular lesion causing the nephrotic syndrome progresses and the GFR declines, the degree of proteinuria often diminishes so that the hypoalbuminaemia and oedema improve. VENOUS THROMBOSIS. Hypovolaemia and a hypercoagulable state predispose to venous thrombosis. Prolonged bed rest should therefore be avoided. Once renal vein thrombosis has occurred, prolonged anticoagulation is required. Thromboembolism is exceptionally common in nephrotic syndrome due to membranous glomerulonephritis and prophylactic anticoagulation may be warranted. • SEPSIS. Sepsis is an important cause of death in nephrotic patients. The increased susceptibility to infection is partly due to loss of immunoglobulin in the urine. Pneumococcal infections are particularly common. Early detection and aggressive treatment of infections, rather than long-term antibiotic prophylaxis, is the best approach. OLIGURIC RENAL FAILURE. A low blood volume and hypotension may lead to underperfused kidneys. Acute tubular necrosis may therefore readily develop when renal ischaemia occurs from other complications such as blood loss or septicaemia. 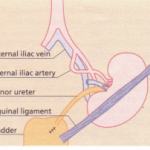 In some patients, uraemia appears to result from derangements in renal perfusion in the absence of hypotension. Albumin infusion combined with mannitol or another diuretic may initiate a diuresis in oliguric renal failure. LIPID ABNORMALITIES. It is suggested that these are responsible for an increase in the risk of myocardial infarction or peripheral vascular disease. There is no consensus on whether lipid-lowering agents should be prescribed routinely.